The Heart Keepsake is hand cast and made in solid brass. It is presented in a velvet presentation box. 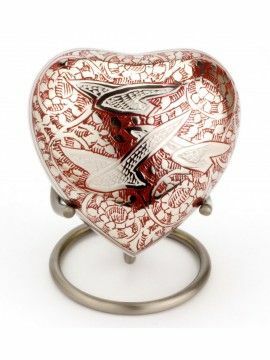 This keepsake measures 3’’ and will hold a small amount of your loved ones ashes. The ashes are placed into the urn through an opening in the back of the keepsake. Please note the stand is for display purposes only and the keepsakes comes in a velvet presentation box.